Looking for Pipe and Drape in the Huntsville, AL area? 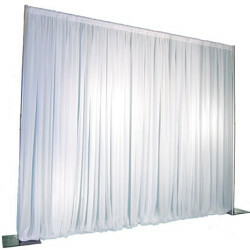 Look no further, Elegance Designs & Rentals has pipe and drape in 8ft and 7ft – 12ft adjustable heights and 6ft – 12ft widths. This entry was posted in Uncategorized and tagged AL, backdrop, Chuppah rental, Huntsville rental, Madison, Pipe and Drape rental by Inetha23. Bookmark the permalink.